This week on the Food Network, Giada DeLaurentis, Ina Garten and Rachel Ray all demonstrated different ways to squeeze a lemon. Giada squeezes it into her hand to catch the seeds; Rachel squeezes them as pictured below so that the seeds don’t fall out and Ina just takes her chances and pulls the seeds out. I love my citrus reamer and just to prove that it is the best method, I conducted a little experiment. I have plans to make a lot of lemon cream so this was as good a time as any. Juicing Lemons, Techniques with Yield Results: I juiced 3 lemon halves as described above and got about 1 Tbsp. from each half. With the citrus reamer I got 2 Tbsp. or twice as much juice. 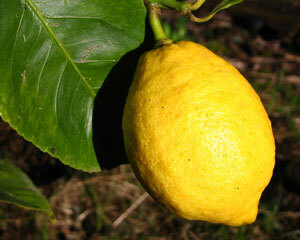 So the moral of the lemon story is that a reamer yields the most juice plus it saves time and money. It’s especially prudent to make sure your lemons are at room tempreature. Lemon Cream (aka lemon curd) is very versatile culinary staple – great for fresh fruit tarts, especially paired with raspberries and blueberries. You can mix it with whipped cream for a light mousse, or use it as I did with Anna’s Vanilla Cupcakes. You can make this cream with limes or meyer lemons too. Save the whites for making angel food cake, which is also delicious with lemon cream. Melt the butter in a heavy bottom sauce pan over medium heat. Add sugar and stir until it disolves. Add the lemon juice and zest. With a whisk, mix the egg yolks together then pour into the butter sugar mixture whisking the whole time. If you have a candy thermometer, the curd is done when it is thick and reaches 168 degrees. The finished cream will thicken as it cools too. 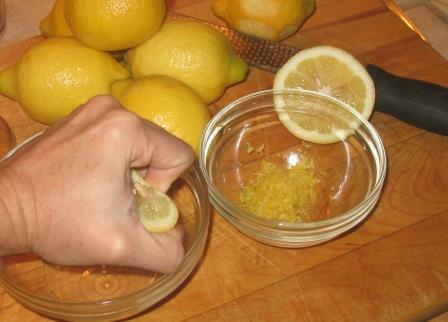 PS from Kimberly: I also love my citrus reamer and have always found it to be the best way to juice a lemon. Now, I know that I am right. Excellent!